Hello Kitty by OPI Cherry Blossom collection: Nail that Spring Time look! Now I do apologise in advance; I'm not usually the best with nail polish since my hands are pretty shaky. Although not really a big-on-nails person, I simply could not resist the siren call of the kawaii-desu set of 4 wearable, and might I says staple shades that great as a stand alone or for nail artwork. Not for the mild-hearted, Cheery Blossoms is a shade for the confident lady who speaks her mind and lets her nails do the talking; a bright poppish red! Definitely a mood-uplifter! For the perennial sweetheart, this slightly shimmering blush pink shade spells grown-up demure without being overly girly. I actually liked this shade the best; a milky lilac shade that can also double as a nice base shade or if your going for more understated nails. The 4th shade is just a lovely basic bone white so I would say its more for accent work, and paired with shade Dreaming of Spring, you can perfect the ideal French Manicure tip! 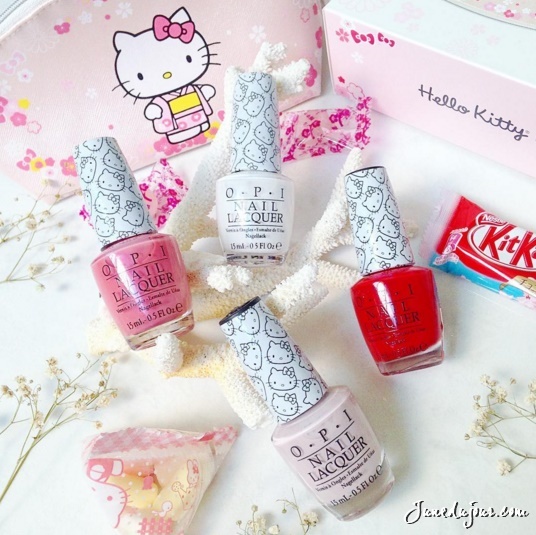 The Hello Kitty by OPI Cherry Blossom collection also features the Blossoms In My Bag duo pack ($26) which gets you 2 nail lacquers (Showered by Petals & Sitting Under Cherry Blossoms) and a charming kimono-wearing Hello Kitty cosmetic bag (below). But fastest fingers first (pun totally intended: This Hello Kitty Cherry Blossom collection is exclusively available only in Southeast Asia, China, Japan, Australia & New Zealand and will be available from end February 2016 at selected Watsons branches and official OPI branches. Thank you Coty Singapore for sending this over!